The Aquarelle collection will allow you to create your own hybrid masterpieces. Are you tired of the usual templates and ready designs? 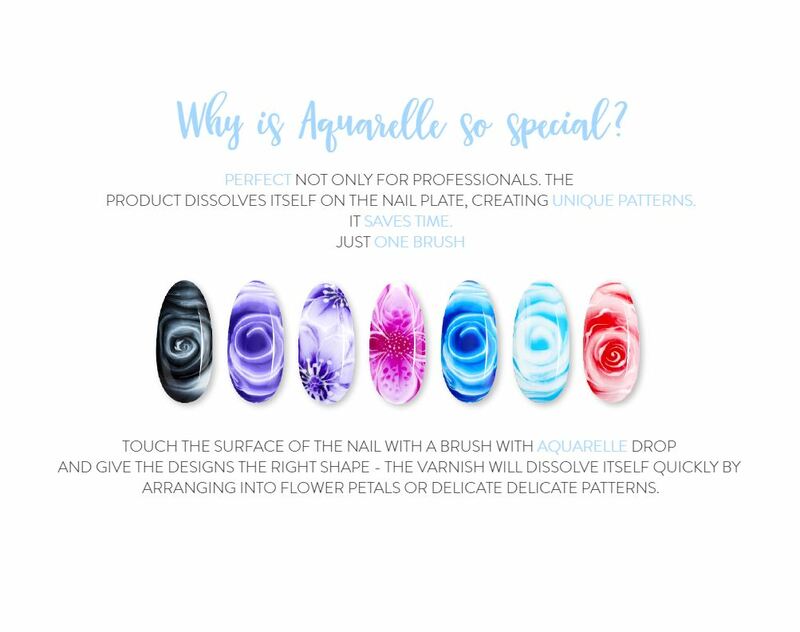 Discover the Aquarelle hybrid varnish collection, an absolute breakthrough in nail stylization. This product is used to create charming effect, i.e. the so-called "wet painting". Thanks to its unique properties it dissolves very quickly creating eye-catching decorations in just a few seconds. With Aquarelle hybrid varnish, you will achieve the desired effect faster than in the case of a classic hybrid. It dissolves nicer and faster. And you do not have to combine and dilute products in a complicated way. That's why you save a lot of time and nerves, and in return you get a pleasant result. 1. Gently polish the nail plate with the polishing block . Apply Hard Base and cure in UV/Led lamp. 2. 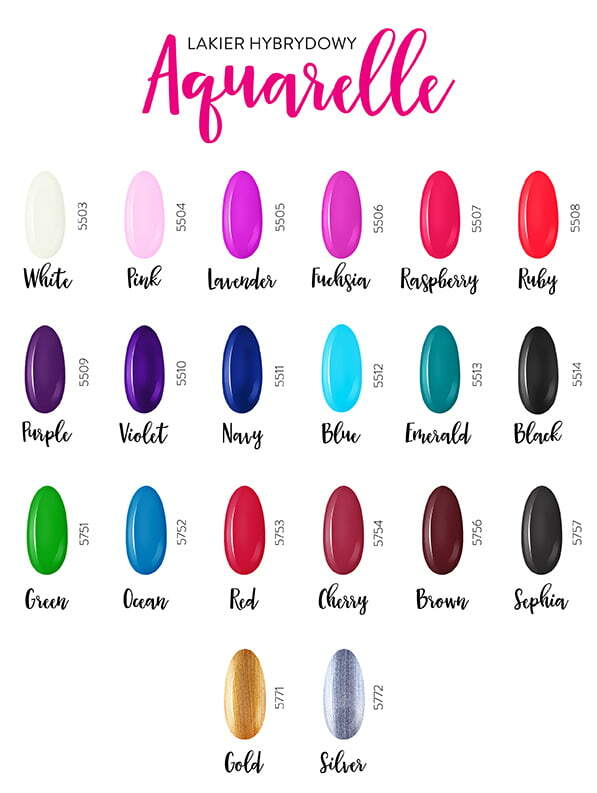 Apply color from the standard range of NeoNail hybrid varnish. Two thin layers is recommended - each time to be hardened in UV/Led lamp. 3. Apply a coat of Aquarelle Base Clear (if the color underneath is different from white) or Aquarelle Base White (if the color underneath is white), do not harden/cure. 4. Place a small amount of Aquarelle varnish in a small crystal washer. Using a thin brush, pick up the color from the holder and make your design pattern, then harden/cure in UV/Led lamp. 5. In order to prolong the durability of the manicure made with Aquarelle varnish, two layers of Hard Top should be applied. However, in the case of increased exposure to sunlight or using a tanning bed, we recommend applying one layer of Hard Top and a second layer of Top Sunblocker. After curing, rinse the adhesive with cleanser. 6. In order to remove the gel-polish from the nails, it should be tarnished with the shining a polishing block and then apply Acetone on Foil Nail Wraps (or use a dust-free swab and cover it with a fingernail, then wrap it with aluminum foil) and leave for a period of about 10 minutes. If there are remains of the hybrid varnish, remove them with a wooden stick or metal hoof. Polyurethane Acrylate Oligomer, HEMA, 1-Methoxy-2-propyl acetate, Hydroxycyclohexyl Phenyl Ketone, Bis-Trimethylbenzoyl Phenylphosphine Oxide, +/- CI 77891, CI 77491, CI 77510, CI 77289, CI 77492, CI 77266, CI 77742.